Amit Shah mentioned that the party is likely to remove Article 35A by 2020. New Delhi : Yet again, Article 35A of Indian Constitution is making controversial headlines. Lately, BJP President Amit Shah has said that abrogating Article 35-A is the party's manifesto and it is a commitment to the citizen of the country. He added that 'it has not happened till now' as the party do not have majority in Rajya Sabha. Amit Shah mentioned that the party is likely to remove Article 35A by 2020. But, the specific aim of Bharatiya Janata Party depends on the result of Election 2019. The party may work on it only if it comes to power this time. Before, we get into the depth of the news, it’s worth to know what excatly in Article 35 A, how did it come about and why does it matter so much to Indians. 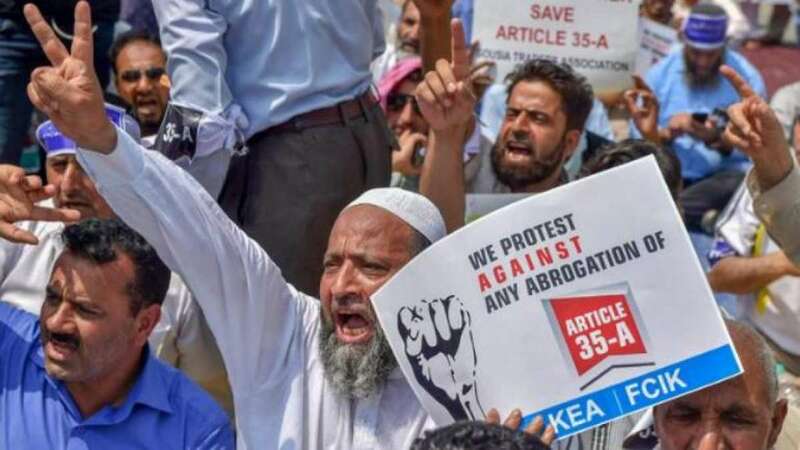 Article 35A is a provision in Indian Constitution which gives the Jammu and Kashmir legislature the right to decide who are the state’s ‘permanent residents’ and thus entitled to special rights over jobs, residence and the right to buy and sell land and property. The provision mandates that no act of the legislature coming under it can be challenged for violating the Constitution or any other law of the land. Article 35A was incorporated into the Constitution in 1954 by an order of the then President Rajendra Prasad on the advice of the Jawaharlal Nehru Cabinet. It was incorporated as an agreement between Nehru and the then Prime Minister of Jammu and Kashmir Sheikh Abdullah, which extended Indian citizenship to the ‘State subjects’ of Jammu and Kashmir. The Presidential Order was issued under Article 370 (1) (d) of the Constitution. This provision allows the President to make certain “exceptions and modifications” to the Constitution for the benefit of ‘State subjects’ of Jammu and Kashmir. Why is Article 35A important? A writ petition filed by NGO We the Citizens challenges the validity of Article 35A. It argues that four representatives from Kashmir were part of the Constituent Assembly involved in the drafting of the Constitution and the State of Jammu and Kashmir was never accorded any special status in the Constitution. The makers of the constitution did not intend to give permanent status to Article 35A. Another petition was filed by Charu Wali Khanna claiming that there is gender discrimination in Article 35A. Meanwhile, Omar Abdullah was involved in a verbal fight with Prime Minister Narendra Modi. At a rally in Bandipora, Abdullah said that he would like to bring back the posts of "President" and "Prime Minister" for the state of J&K. Addressing a rally, the former chief minister said, "Rest of the princely states merged with the country without condition, but we had said that we have our identity, our own constitution. We had our own 'Sadar-e-Riyasat' (President) and 'Wazir-e-Azam' (Prime Minister) too. By God's grace, we will bring that back." Omar spoke about the BJP's promises of revoking Article 370 and Article 35A that grant special status to J&K and special rights and privileges to the citizens of the state. He mentioned that the terms of agreement will have to be renegotiated if these Articles were scrapped, Abdullah said, "Obviously, what will be our relationship with this country if you remove that special status. Our relation is on that basis." Responding to Abdullah, the Prime Minister Modi, who was addressing a rally at Secunderabad in Telangana, said, "He [Abdullah] says we will take the clock back and replicate the situation before 1953 and there will be two Prime Ministers in India, Kashmir will have its separate PM."